Roseau, Dominica– April 12, 2010…… Hon. Marwick Khumalo, a Member of Parliament of the Kingdom of Swaziland and a member of the Swaziland Branch of the Commonwealth Parliamentary Association (CPA) paid a one- day visit to Dominica last week as part of an effort to explore areas of cooperation and expand dialogue between the African region and the Caribbean region within the CPA. While in Dominica, Hon. 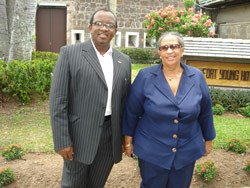 Khumalo met members of the CPA Dominica branch, including, Prime Minister, Hon. Roosevelt Skerrit, Speaker of the House of Assembly, Hon. Alix Boyd Knights, Deputy Speaker, Hon. Ronald Toulon and Minister for Information, Hon. Ambrose George. The Swaziland M.P also added that in terms of parliamentary practice and procedure, “there is a lot we can learn from Dominica”. Speaker of the Dominica House of Assembly and Chairperson of the Dominica branch of the CPA, Hon. Alix Boyd Knights explained that follow-up discussions to the visit by the Swaziland MP, will take place during the meeting of the Executive Committee of the Commonwealth Parliamentary Association set for Swaziland in June this year. Hon. Knights will represent Dominica at that meeting. The Kingdom of Swaziland, a former British protectorate, sandwiched between Mozambique and South Africa, has a population of just over one million people.